Given John Ringling’s passion for the theatrical movement, color, and emotion of Baroque art, it is apt that the Museum’s first director, A. Everett Austin, Jr., dramatically expanded the showman’s collection by acquiring an 18th-century Italian theater. The theater’s evolution began in the 15th century with Caterina Cornaro, the daughter of a Venetian merchant, who became – through an arranged marriage – the Queen of Cyprus. As a reward for her service, she was granted the village of Asolo, Italy, where (in exile) she reigned over a court renowned for its grace and beauty. In 1798, architect Antonio Locatelli created the theater in the great hall of Caterina’s palace. When, in 1855, Francesco Martignago redesigned the theater, he preserved the u-shaped form, leading scholars to conclude that the renovation duplicated the original plan. The theater remained in this setting until 1931, when it was dismantled to make way for a film theater. German antiquarian Adolph Loewi purchased the artifact and stored it in Venice for the duration of World War II. 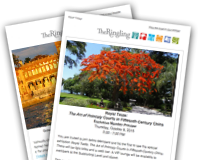 In 1949, the Ringling purchased the theater for $8,000. It opened in its new home in 1952, remaining in the Museum of Art until a new building was constructed for it. When it reopened in 1958, the Asolo became the birthplace for the performing arts in west central Florida. By the close of the 20th century, however, the theater was underused and under funded. It again fell into disrepair. With the Ringling Master Plan in 2000, restoration began. The panels were again dismantled, and the Museum’s conservation staff worked for over two years to conserve and restore the ornate beauty. The 2006 reinstallation in the Museum’s Visitors Pavilion adheres to the guidelines of the International Congress of Architects and Technicians of Historic Monuments in the Venice Charter for the Conservation and Restoration of Monuments and Sites: “the aim is to preserve and reveal the aesthetic and historic value – based on respect for original material and authentic documents. It must stop at the point where conjecture begins ... any extra work which is indispensable must be distinct from the architectural composition and must bear a contemporary stamp.” Hence, the structure that envelops the 18th-century artifact, along with the auditorium seating and ambient lighting, are all distinctly of the 21st century.